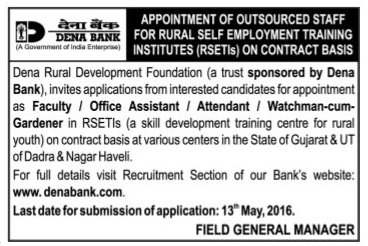 Dena Rural Development Foundation (DRDF) has published a Advertisement for below mentioned Posts 2016. Other details like age limit, educational qualification, selection process, application fee and how to apply are given below. Educational Qualification : Eligible candidates should possess Graduation/ Post Graduation viz. MSW/ MA in Rural Development/ MA in Sociology / Psychology/ B.Sc (Veterinary), B.Sc (Horticulture), B.Sc. (Agri. ), B.Sc (Agri. Marketing)/ B.A with B.Ed etc. for S.No-1, Graduate viz. BSW/ BA/ B.Com./ with computer knowledge for S.No-2, Matriculation for S.No-3, passed 7th Standard for S.No-4 with relevant experience. Age Limit : Between 22-40 years as on 31-05-2016. Application Fee: Candidates should pay Rs. 400/- for all others (including OBC/ Ex-Servicemen), Rs. 50/- (Only Postal Charges) for SC/ ST/ PWD candidates by Demand Draft (DD) drawn in favor of “Dena Rural Development Foundation (DRDF)” payable at Ahmedabad/ Raipur. How to Apply: Eligible candidates may send their application & necessary documents DD in original to the concerned address as given address in the notification on or before 13-05-2016.